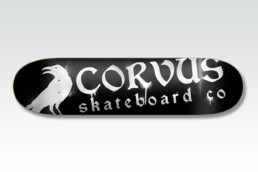 My client, AAS, was a skateboard manufacturer that was having issues getting their product into the hands of their core demographic. They had spent a good amount of time and money on developing some new coatings and glues for skateboard decks, and they got great reviews by the pros testing them. But to skaters their branding and graphics came across too young, and their boards were viewed more as a toy then the real thing. They asked me to develop a brand that had an older, more authentic feel. These three decks were what I pitched them as an idea. I view the project as a success, as the first sample of each deck was stolen before they could ship them out to me to look at. 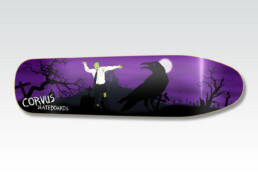 They remade the decks and sent them out the following week. Unfortunately, it was too little too late, and AAS went out business before we could go to production with these. I really did like the way these turned out, and two of the three hang on my office wall. The third is hanging at home.